But wait, surely my boss doesn't need a jailbroken phone? Actually, the iPhone for some stupidly reason has pathetic keyboard layouts obviously not designed by actual users of those languages. This is the default Bopomofo keyboard on the iPhone. 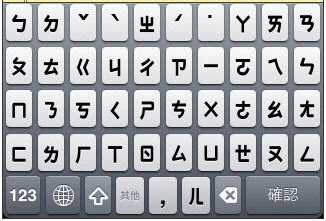 Bopomofo is a system for phonetically writing the Traditional Chinese characters. 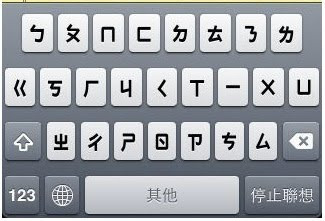 And this is the modified Bopomofo keyboard in the more traditional layout that every Bopomofo user on the planet is used to, and it's only available to jailbroken phones. At first glance, it might seem that the better layout is simply a vertical layout compared to the horizontal layout, but the horizontal layout is actually all the phonemes lined up in order. Imagine if the iPhone's English keyboard is laid out as A B C D E F G H... instead of the standard QWERTY layout. 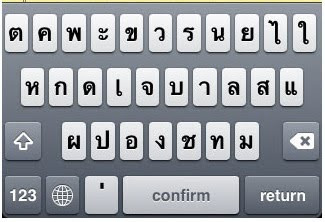 The exact same problem also occurs for the Thai language keyboard. 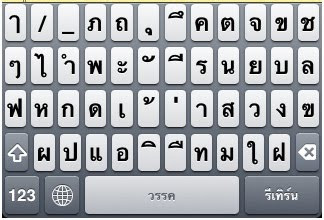 This is the Thai language keyboard that was much advertised as a new feature included in iPhone OS 3.0. Unfortunately, that layout is completely unusable in real life since it's not based on any standard. This one, again, is only available for jailbroken phones. Once again, at first glance, it seems that the second keyboard contains seemingly random characters. However, that is the standard Thai keyboard layout used on every computer and typewriter. Oh, and when I was paying for the iPhone, the salesguy turned his back on me and typed something really quickly into the iPhone. I couldn't figure out what he did until I came home. He modified the email signature to read: "Sent from my TrueMove iPhone3GS".